﻿Wine Lovers of NYC and Rooftop Crawl invite you to a fantastic tour of two Manhattan rooftop bars where you can meet amazing fellow wine lovers, enjoy two complimentary rosé drinks (one at each rooftop bar) made using top wines from beautiful Chateau Val Joanis from the Luberon in Provence (http://www.val-joanis.com) and relax with views of the Midtown sky! All for a special discounted price of $25! 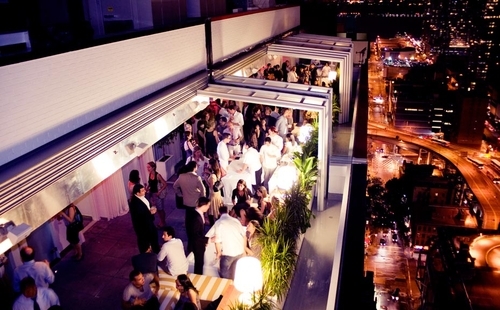 Nightlife impresario Richard ‘Ric’ Addison's 5000 square foot Monarch Rooftop Lounge NYC offers impressive indoor and outdoor areas with specatualr vireew of the Emprie state Building and the New York skyline. The Monarch provides each visitor with top nightlife features like designer cocktails and light food menu items. The design accents provoke an elegant charm, but the comfortable couches convince you that this is a place to relax and enjoy glamorous drinks while you mingle with some top New Yorkers. • You will visit each rooftop for a 2-hour duration minus travel time. Please dress your best. No sneakers, boots, hats, baggy attire, shorts or athletic attire. 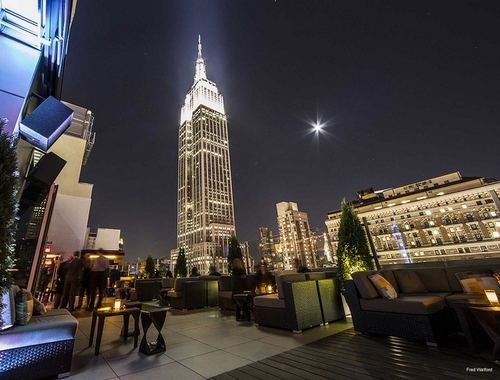 Nightlife impresario Richard ‘Ric’ Addison's 5000 square foot Monarch Rooftop Lounge NYC offers impressive indoor and outdoor areas with spectacular views of the Empire State Building and the New York skyline. The Monarch provides each visitor with top nightlife features like designer cocktails and light food menu items. Design accents provoke an elegant charm, but the comfortable couches convince you that this is a place to relax and enjoy glamorous drinks while you mingle with some top New Yorkers. The Sky Room, with 360 degree views of Manhattan and the Hudson River from the city's highest rooftop lounge, takes NYC nightlife to the next level. Atop the Marriot Times Square, you will find a two-level lounge where Sky Room Rooftop Bar provides a sanctuary for people who are looking to enjoy a drink and mingle with some of New York City’s finest folks in addition to world travelers who are in town for business or leisure. At night, you can dance under the NYC sky as the best DJs around spin a variety of festive music.